That’s how much the University of Virginia athletics department receives each year from the academic side of the institution, a subsidy that helps balance the Cavaliers’ $100.3 million budget. Paid out of student fees, the money is more than double the size of the subsidy received each year by Texas Tech athletics ($5.7 million). 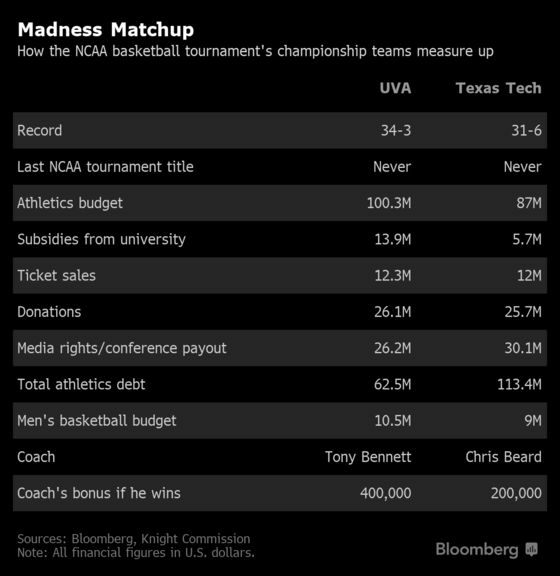 UVA’s Cavaliers and the Texas Tech Red Raiders play Monday night in the NCAA Tournament championship game. It’s the first trip to the finals for either team.